In 1895, Porto started electric service using converted trailers and mule cars on Brill 21E trucks. Porto bought more cars from J. G. Brill of Philadelphia in 1904, 1909, 1910 and 1912. In 1920 CCFP wanted to acquire 35 more trams, but lacking the money started building copies of the Brill design in the Porto shops using imported trucks from Brill and GE motors. Building new and rebuilt trams continued until 1951. Tram 210 was built in the Porto shops in 1940 and spent most of its time working out of Boavista Station. It was renumbered as 201 in 1994. The Porto municipal tram company took over the system from CCFP in 1946. In 1951, the tram fleet consisted of 193 motor trams (101 Brill types) and 24 trailers operating on 250 km of track. Tram lines started to be replaced by trolley buses in 1959. By 1997, only one tram line was left with 3 trams providing service. This car was acquired by the OERHS from the Porto Tram Museum in July 2006. The car was shipped from Portugal to Port Elizabeth, NJ, from there it was trucked across country to our museum. Many of the Porto trams have found homes at museums around the world. 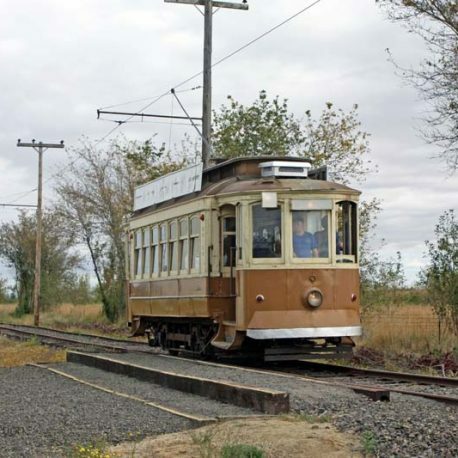 Check out the Porto Tram Museum web-site for additional information. The tram is of a Brill design with extended platforms. 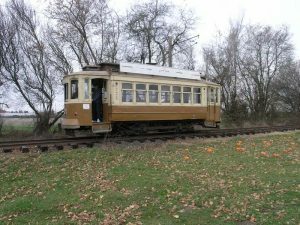 IT is a 4 wheel car very similar to the early Portland streetcars. It bears a striking (albeit small) resemblance to the museum’s Council Crest cars (#503 & 506).